This is not what you think. 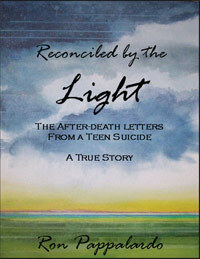 Reconciled by the Light: The After-Death Letters from a Teen Suicide is more than just a tear-jerker or parental warning. Here stands a compelling combination of paradoxes: a teenager’s slow descent into suicide, and how such a dreadful death transformed his family in so many positive, unexpected ways. But then, Pappalardo’s heartfelt account is all about reconciling - whether it be grief, guilt, or even seeming paradoxes. Joshua Pappalardo’s life was not an easy one. From a young age he was plagued by a sense of alienation, the feeling of not fitting in - even within his own family - generating an angst that eventually consumed him. The doors that opened between “Josh” and his family are described in novel-like fashion, as the desire for a son to explain and apologize, and for a father to understand and move through his grief, are reconciled in riveting-yet-comforting descriptions, dialogue, and letters. How Josh made himself known is about as intriguing as a story can be. In about 100 pages, expect to experience some of the most reassuring words you will ever read about life after life, because death really isn’t so final as it might feel to those left behind. Balance used to mean being able to stand up without falling down, or carrying a load of groceries successfully from the car to the kitchen without losing the eggs in the process. But these days, balance is a word whose meaning has greatly expanded in proportion to a world that’s become faster and therefore more overwhelming. With so much going on around us, it often feels downright impossible to keep up with it all. So we sacrifice our health - mentally and physically - in a chronic attempt to keep our heads above water. And that’s when our lives start going out of balance. Gault uses four primary avenues to address rebalancing. 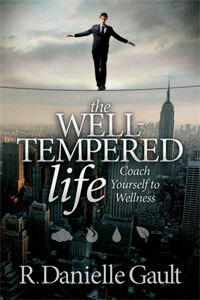 Through simple yet thorough explanations, The Well-Tempered Life uses personality theory (getting to know yourself better, creating insights), coaching (to get you moving in the right direction using solutions), yoga (to keep your sanity and improve your overall health), and reflexology (to address specific physical issues) as tools that not only complement each other, but are almost instinctive to use together. It may be that you wind up taking a good, long look at what your life has become, and let go of whatever you possibly can in order to simplify - which is the exact opposite of overwhelm and the stress it creates. The tools provided by Gault will help you keep up with the rest. In this follow-up to her best selling The Indian Slow Cooker, Singla has taken her undeniable knowledge, skills and passion for Indian cooking to a whole new level. 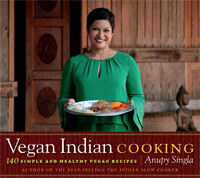 And she has managed to do so by creating simple, healthful, and incredibly delicious, entirely vegan dishes. Woohoo! Seriously, this is from an Indian food addict who still has concerns as to whether the lovely proprietors of my favorite Indian restaurant know I mean ghee as well when I request no dairy in my dishes. Singla has solved this problem for me and many other vegans who can now rest assured that our meals will indeed be 100% plantbased and unbelievably delicious. Known for its health promoting ingredients and qualities, Indian food is the perfect addition to any cook’s kitchen. And with Singla’s help you don’t need to be a professionally trained chef to execute her mouth-watering recipes, or spend entire days a slave to your stove. This book is beautifully organized, highly educational, and the photos are breathtaking. I cannot wait to try the Cashew-Stuffed Baby Eggplant. Hungry Yet? 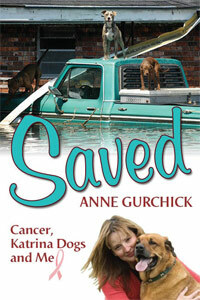 Around the same time that Hurricane Katrina was ravaging New Orleans, leaving the city and its inhabitants in a state of devastation and desolation, Saved author and animal rescue and welfare volunteer, Anne Gurchick found herself in the midst of her own tropical storm as she battled breast cancer. And for awhile it appeared as though the raging waters of disease and despair would claim her life, just like the thousands who died in Louisiana. Miraculously, Gurchick turned the tables on Mother Nature, and instead of focusing on all those who were lost, she decided to try to save as many as possible of those who remained— including herself. Hers is an inspirational account of hope, selflessness, and above all, the healing spirit of friendship. While still reeling from the effects of chemotherapy, Gurchick and friends headed to New Orleans to volunteer in the efforts to rescue and re-home the thousands of animals that had been thoughtlessly and cruelly abandoned during the city’s rescue initiations. It is there, in the middle of a broken city, where the surviving animals had been relegated to living on the streets, surrounded by the stench of filth and death, that Gurchick is reminded of her worth and purpose. And where it became clear that although her efforts may have resulted in saving some dogs, in the end, it was they who saved her. John Calabrese is the Editor-at-Large at Creations Magazine and has a private counseling practice in Huntington, NY.